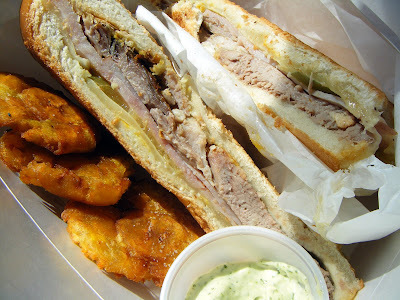 Say hello to a sandwich well worth waiting for: Paladar Cubano’s cubano, a $6.50 two-fister so bountiful the construction crews (and other trenchermen) who seek out this parking lot pit-stop on the corner of 90th and Aurora can’t finish their lunch either. My thanks to Eater Ken Astrein for turning me on to the place: one that’s easy enough to miss if you’re heading south on Aurora given the number of cars parked in the lot — poised kitty-corner to Taco Bell and just across from Acme Auto Electric. Hang a right onto 90th heading south, or take a left off Aurora if you’re driving north. There, Havana-born Pedro Vargas can be found taking orders for the kind of homestyle eats hard to come by in the Great Northwest. And when he’s not blending batidas de frutas, pressing a sweet shot of cafe cubano, wrapping spicy sandwiches de pollo asado or ringing up ropa vieja, he’s grabbing a pair of drumsticks — the wooden kind — and showing us how to really cook: with his band Grupo Ashe, who’ll be performing at a free concert August 27 as part of City Hall’s Seattle Presents noontime concert series. “Thanks for waiting!” says Pedro. No sir, the pleasure was mine. So, what’s a guy like Pedro Vargas — who’s recorded a Grammy-nominated album with Barbarito Torres, and toured in North and South America, Europe and Asia — doing stuck in a truck on Aurora? 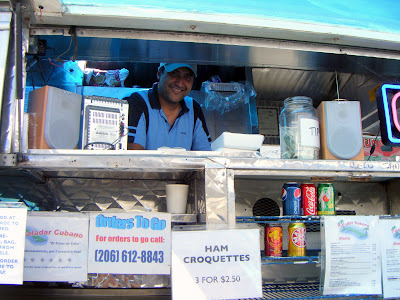 His food (much of which was prepared by a young woman who moved with grace in small quarters) is the real deal insisted the Dominican duo who waited beside me at this picnic table-paradise-for-Caribbean-expats. And after downing his lunch, one of them patted his stomach and offered me half a cubano while I waited for my own. 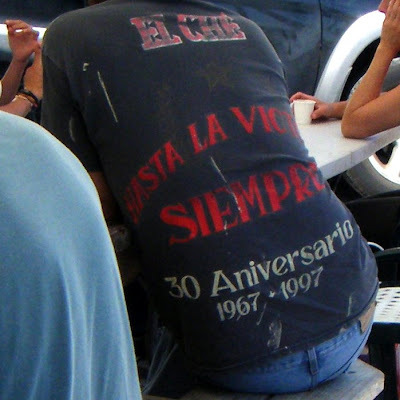 “No thanks,” I said, thinking instead that he might want to offer it to the guy who pulled up in a ladder-topped van and sat nearby pledging his allegiance to El Che. Paladar Cubano is open Mondays though Saturdays 11:30 a.m. till 8 p.m. May I suggest not showing up during the busy lunch hours if you’re in a rush, or calling ahead to place your order if you are (206-612-8843).